"Now that we're off that dejarik board of a planet, I say we burn sky until we see lines." "This crystal - seems to be the heart of Telos. What a discovery indeed." Telos IV, often called simply Telos, was a world located in the Outer Rim Territories of the galaxy and situated on the Hydian Way hyperroute. The world held a strategic position within the edge of Galactic Republic space and, as early as 4,000 BBY, played host to the Agricultural Corps, where Jedi who failed their training were sent to work as farmers and laborers. During the early part of the Jedi Civil War, its surface was devastated by Sith forces under the former Republic Admiral Saul Karath. Its surface was eventually restored by the Telosian Restoration Project, so that by 32 BBY it was once again a lush planet. "Telos" (τέλος) is an ancient Greek word meaning "purpose." In modern Greek it means "end." In philosophy the root word "Teleology" is the study of ends, goals, and desires of living things. In 180 ABY, Shadow Jedi Atticus Jetaime, Cyclone McLeod and Diakonos Delcon traveled to Telos IV on an exploratory mission. While there, they discovered a crystal of extreme power…that Cyclone named "the heart of Telos." It was strong in the force, and drove them to establish the Telos Jedi Order as their new base. The Sith also wanted to tap the crystal's power, and they also set up a base of operations that started a civil war. The war ended when unknown attackers fire bombed the planet. The fallout from this attack drove all the citizens underground - and period that would last 20 years. During that time, many different factions from around the galaxy attempted to show their strength within the underground city. This all came to a head with the rise and fall of the Dark Lord Morpheus. Morpheus spent his time building a Dark Jedi army of his clones, as well as building a Star Forge over Telos IV. On a warm summer day in 200 ABY, the army of Morpheus struck Telos, driving all of it citizens out to the surface. At this point, the Galactic Empire of Telos IV began under the rule of Emperor Morpheus. The Jedi and Mandalorians formed a rebellion led by Generals Aden Kandosi and Xoza Shadow - driving Telos into a long, bloody Civil War. Two years after the war began, Morpheus and his army were defeated…Telos was again free. A prosperous time of democracy and reconstruction came upon Telos. 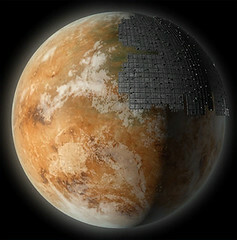 By 203 ABY a grand city was completed and became the Capitol of Telos. A Jedi by the name of BelMakor Speedwell was elected Governor. It seemed all was good, but evil interests began to spin their webs. The Sith infiltrated the government, and a powerful woman named Lorena took control of BelMakor's mind and married him. Telos was once again thrown into chaos. The Empire made a base on Telos, hoping to bring some sort of stability. Unfortunately, in 205 ABY, the Star Forge (long abandoned), came crashing down on the surface for unknown reasons. The core of Telos IV was greatly damaged and thousands perished. The majority of the civilians were evacuated by the Empire. And then, a month after the Star Forge crashed, Telos IV exploded…it is now only a memory.